A high quality air fitting is crucial when it comes to building a LEAK-FREE air suspension system! The fittings we offer are the best money can buy, hands down! 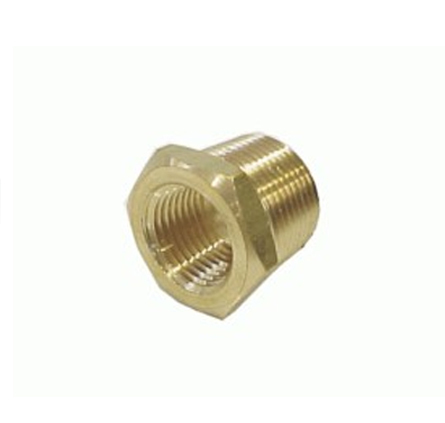 Our air fitting reducers are used to reduce the size of your air ports. These will screw into a 1/2 inch npt port and reduce it to that of an 1/8 inch port. You can use them on 1/2 inch valves to slow them down to the speed of a 1/8 valve. Another way to use these would be to install them in your 1/2 inch air bag ports to reduce their size to to a 1/8 inch port size to install an air gauge sensor or air gauge supply line. Basically, these can be very helpful in slowing down your air ride system without having to purchase new valves. We suggest that you should draw out your lines and fittings, and order enough to complete your kit without running to the store every hour or two. Click here to return to our air ride products page for more air fittings and other air suspension products we offer!